The organisers of the hugely successful Country to Country (C2C) music festival have announced more artists and events appearing during Country Music Week, the exciting, brand new week-long series of shows taking place from Mon 2 to Sun Oct 8, 2017 in London venues. ANGALEENA PRESLEY and MICHAEL TYLER –O2 Shepherds Bush Empire, London – seated show. (See UK tour details below). 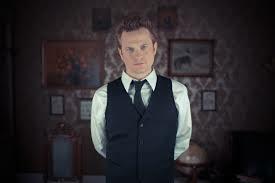 Sun Oct 8 JACE EVERETT – The Borderline, London The CMA Songwriters Series has been presenting the very best of Country Music’s songwriters and artists, whose hits are known worldwide, since 2005. The shows are intimate presentations where songwriters exhibit their craft and share many of the stories behind the songs they have penned. Based on the instant sell-out success at last year’s C2C, this series will return to the UK kicking off a four-date tour with a show in London Oct. 3 at a fully-seated Shepherds Bush Empire. 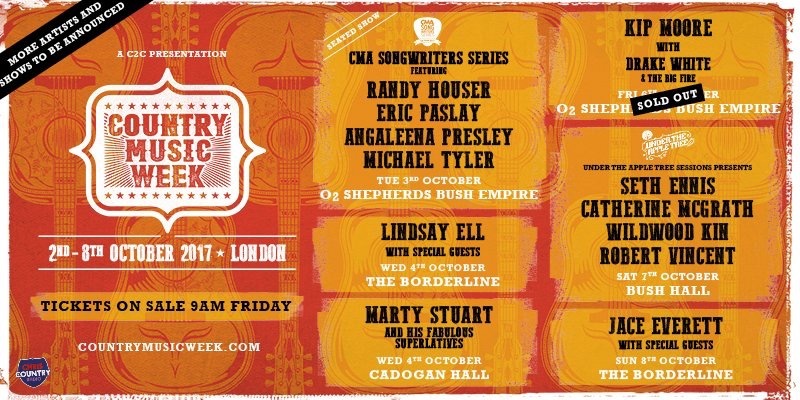 Tues Oct 3 CMA SONGWRITERS SERIES – London, O2 Shepherds Bush Empire – seated show. With an inimitable voice the New York Times describes as “wholly different, thicker and more throbbing, a caldron bubbling over,” Randy Houser racked up three consecutive No. 1 hits and more than four million in singles sales to date with his Stoney Creek Records album, How Country Feels. He topped the charts with the title track, “Runnin’ Outta Moonlight” and “Goodnight Kiss” (also his first No. 1 as a songwriter) and earned critical acclaim for his powerful delivery of the Top 5 smash and CMA Song of the Year–‐nominated “Like A Cowboy.” Houser added a fourth No. 1 to his catalogue with “We Went” from his latest album, Fired Up, and has been tapped to perform at several major country music festivals in 2017. 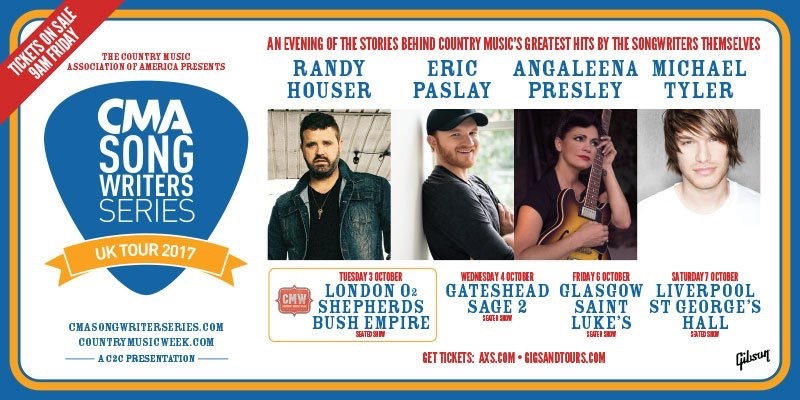 For more information, visit http://www.RandyHouser.com or follow on Twitter/Instagram @RandyHouser and http://www.Facebook.com/RandyHouser. Raised in the small town of Beauty, Kentucky, Angaleena Presley is a singer-songwriter had followed follows her critically acclaimed 2015 debut, American Middle Class, with the 12-track Wrangled, on Mining Light/Thirty Tigers. Angaleena’s “ambitious and riveting” songwriting (Wall Street Journal) punches through each of the tracks which she co-wrote with the likes of Chris Stapleton, Miranda Lambert, Ashley Monroe and Guy Clark. As well as being an acclaimed solo performer, Angaleena is also a member of the chart-topping Pistol Annies trio with the aforementioned Miranda and Ashley. Best known for writing Dierks Bentley’s No 1 platinum selling “Somewhere On A Beach”, Michael Tyler is a self-taught singer-songwriter/musician who began making music when he was eight and was discovered when he was 13 by Michael Knox, the producer best known for his work with Jason Aldean. When Tyler looked at his car’s dashboard after he arrived in Nashville from his hometown in Thayer, Missouri, he noticed a number that’s resonated with him since his arrival: 317. It’s no coincidence that the 23-year-old’s debut album is called 317. It includes the single “They Can’t See”. He won SESAC’s Song of the Year award for co-writing the Dierks hit. With a career spanning 45 years, Bob Harris OBE is UK music broadcasting royalty and he’s interviewed and introduced some of the greatest musicians of all time. But simultaneously he’s been championing up-and-coming artists and providing a springboard for many to go on and forge impressive careers. His online Under The Apple Tree Sessions have become very popular and four talented acts he’s helped will be appearing together in this special show. Singer/songwriter, Seth Ennis, is poised for a breakout in 2017, with early nods as a star on the rise being named as an artist to watch by CMT, Pandora, The Huffington Post, Rolling Stone Country and a CMT “Listen Up Artist.” The 24 year-old multi-instrumentalist, co-wrote, co-produced and played all parts on the recorded version of his debut single “Woke Up In Nashville,” has garnered a reputation in the Nashville music community for having an artistic vision to which has no boundaries. Hailing from Georgia, but now rooted deeply in Music City, Seth Ennis made his international debut at the C2C festival in March 2017, and returns to the UK for Country Music Week and to support Little Big Town on their UK tour. Country music’s newest UK talent hails from the rural outskirts of Belfast. Nineteen-year-old Catherine McGrath’s passion for the sound was initially won over by Taylor Swift’s self-titled album and then she delved deeper into the genre’s new era of talent, including Kacey Musgraves and Dan + Shay. “The reason I love country so because there’s such of range of things you can sing about and it’s so honest.” Coming from a music loving family, McGrath first took up the guitar as an accompaniment for her voice. Newly signed to Warner Bros. Records her debut EP is entitled, One. An award-winning singer songwriter from Liverpool who has recently supported Paul Carrack on tour for the third time, Robert Vincent and has been receiving rave reviews. Bob Harris ​joined the ranks of his admirers after seeing him play live at an event called Bluebird at the Bluecoat ​which brought the legendary Bluebird Cafe from Nashville to Liverpool. Bob invited Robert to record one of his Under The Apple Tree Sessions ​in his home studio and also for his Radio 2 ​show. Clearly this consolidated Harris’ admiration for this talented musician as he awarded Robert the prestigious and first ever Bob Harris Emerging Artist Award ​for Americana UK ​describing him as ”absolutely magnetic”​. Wildwood Kin, a family trio formed in Exeter, borrow heavily from early folk influences, but their extraordinary debut album delves deeply in to other genres. Sisters Emillie Key, Beth Key and their cousin Meghann Loney all sing, swapping leads on original songs, and joining forces on harmonies that have become their trademark, inviting comparisons with the likes of Crosby, Stills and Nash and Fleetwood Mac. Tipped by Jo Whiley, Mark Radcliffe, Steve Wright and Bob Harris and having previously toured with Seth Lakeman and Ward Thomas, the band play several UK headline shows and festivals this year which includes both the Glastonbury , BBC Radio 2’s ‘Festival In A Day’ in Hyde Park and the Cambridge Folk Festival. Having recently signed to the newly re-launched Sony imprint Silvertone, the alt folk band will release their much-anticipated debut album Turning Tides in August. Dust and Dirt is his new album which crosses styles and genres not just from song to song, but as a whole, distilling the craft of Nashville song writing, charging it with the energy and sensibility of rock and roll. True Blood (the smash hit HBO TV series, featuring his swampy “Bad Things” as the theme song) is when Jace Everett went global. He then put out his biggest record to date, Red Revelations , an album brimming with attitude, guitar twang, and dark sensuality and which took Everett from Nashville to Norway, London to Melbourne, and all across the United States. By the Spring of 2011, five of the tracks from Red Revelations had been licensed in film and TV. The new album feature 10 new songs with the new single being “Woke Up in This Town”. 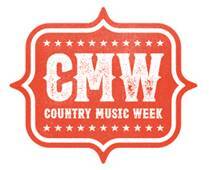 Country Music Week (CMW) will feature live shows and unique events across select venues in central London. The events will recognise and celebrate emerging artists within the broad spectrum of country music, will give fans another opportunity to discover UK and US acts early in their career and will connect fans with the stories behind the songs and will include additional programming and a central hub area. The official radio partner of Country Music Week 2017 is Chris Country Radio. More Programming and supporting partners will be announced soon.